Let me start by expressing my gratitude to you, all of you, followers and visitors alike, for reading my blog. 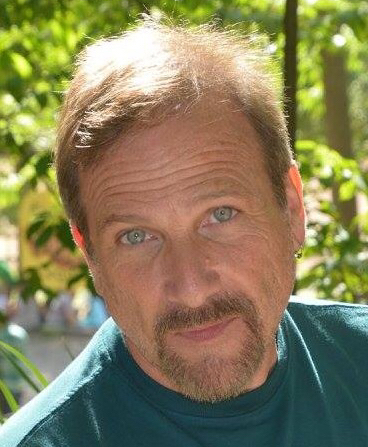 It is an important endeavor for me, but it is your thoughtfulness over its content that gives it meaning. Please know that the effort of your attention in the midst our crowded lives is recognized and gratefully remembered. Not long ago, if someone complimented you saying, “You write beautifully”, you could never be sure whether they were speaking of your writing ability or your penmanship. The art and use of the hand-written letter has drifted into the realms of the rare and the novel, but they are no more obsolete than is a handshake, a smile, an embrace or a whisper. I grump about the various forms of digital communication, though I know they have their place in filling the need for rapid and easy information exchange in an accelerating society. Yet, they needn’t take our souls. We needn’t succumb to the folly that they are worthy vestals for ALL of our necessary expression. They are not. Never before in history have people been more interconnected, and more distant. 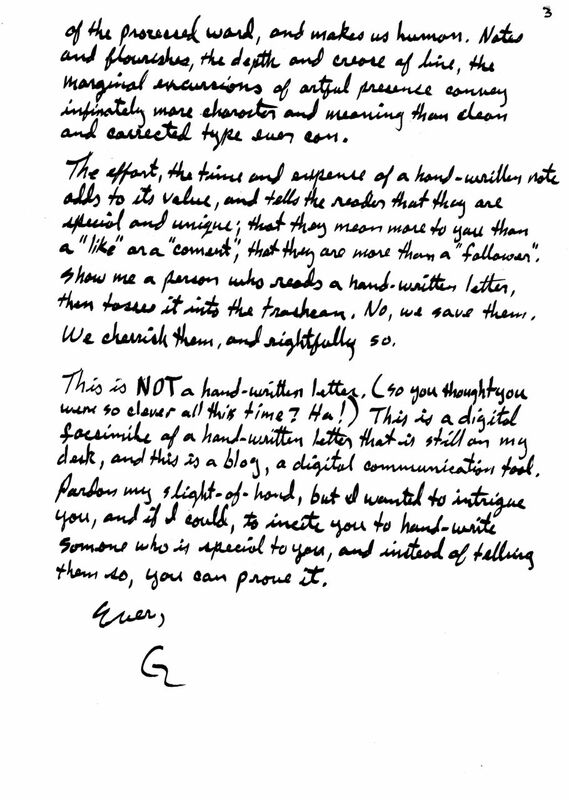 The hand-written letter is more than what is imparted through words; it is a visceral expression. We hold the very page that was writ; our hands touch the hand that held it, touch the ink and stroke of the original thoughts as they were laid down, once and forever unique, and intended for us alone. The written word is now an ancient and indelible part of our collective nature. The very act of putting pen to blank paper to share our consciousness with another is a sacred and personal thing, each stroke writing through time directly into the consciousness of our singular intended. Our words are precious and weighed, deeper and more considered, our imagination is applied to how the listener will hear our words, rather than how we need to be heard. The writer becomes the reader, and this empathy engenders a truth and eloquence that transcends the common. 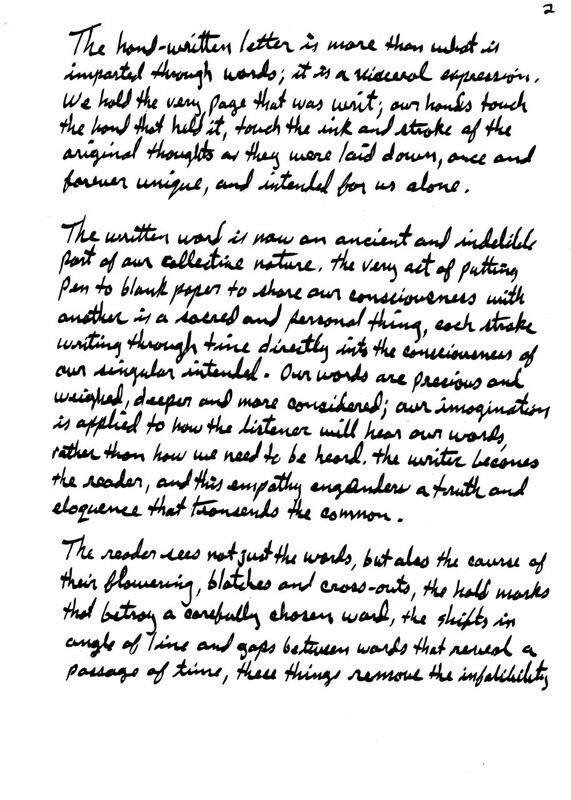 The reader sees not just the words, but also the course of their flowering, blotches and cross-outs, the hold marks that betray a carefully chosen word, the shifts in angle of line and gaps between words that reveal a passage of time, these things remove the infallibility of the processed word, and makes us human. Notes and flourishes, the depth and crease of line, the marginal excursions of artful presence convey infinitely more character and meaning than clean and corrected type ever can. The effort, the time and expense of a hand-written note adds to its value, and tells the reader that they are special and unique; that they mean more to you than a “like” or a “comment”, that they are more than a “follower”. Show me a person who reads a hand-written letter, then tosses it into the trashcan. No, we save them. We cherish them, and rightfully so. This is NOT a hand-written letter. (so you thought you were so clever all this time? Ha!) 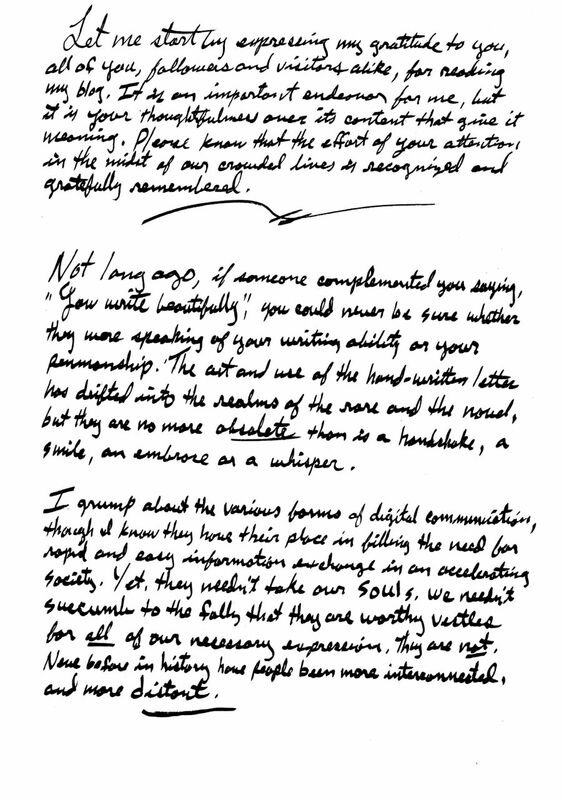 This is a digital facsimile of a hand-written letter that still sits on my desk, and this is a blog, a digital communication tool. Pardon my slight-of-hand, but I wanted to intrigue you, and if I could, to incite you to hand-write someone who is special to you, and instead of telling them so, you can prove it. Next Circles: Why we end up feeling like bad friends. Wonderful! It’s one reason I still take the time to write out actual Christmas cards every year. Thanks for sharing your thoughts. I’m sure your efforts do not go unnoticed! On a somewhat sadder note, my daughters are now (nearly) 17 and 18. Penmanship was not taught to them in school. However, my wife and I made the effort to teach them handwriting. My 17 year old hand writes all of her notes, so that none of the students in her class can cheat by reading them. The other children are flat out unable to decipher handwriting. That is the sad part. That IS sad. My nine-year-old only has it touched on right now. I intend to make sure she has that even if I have to teach her myself as well. And, she loves it! Your 17 year old is a smart girl, good for her. I once tried to learn short hand (remember that?) to use for taking my director notes so no actor could peek. I didn’t quite do it. Fortunately, my penmanship can easily be downgraded to illegible. I love handwriting! Well I wouldn’t be a handwriting analyst if I didn’t, would I? It is such a lost art. So many people are ashamed of their handwriting, for really no apparent reason. I love the uniqueness that everyone’s handwriting is so different! I still think that it is important for kids to learn to write, for two practical reasons; research has recently shown that what is written in notes by hand, is remembered much better than notes taken on a computer. I believe that the physical act of forming words and notes causes the brain to remember better because it adds another nerve path (the hand touching and forming letters) to the visual and auditory that comes in class. A second reason to learn to write: if you don’t know how to read handwriting, you will have a difficult time decrypting old letters and notes from historical archives. Just think of how hard it is for us to read the handwritten and decorated bibles of the 14th century, even if you know the verses, and are adept at latin. That will become the norm for researchers if we don’t continue to read handwriting.